The helicase/SANT-associated (HSA) domain is a predicted DNA-binding domain of ~75 amino acids [(PUBMED:11779830)], which is found in the eukaryotic SRCAP/p400/DOM and SNF2/brahma families [(PUBMED:16024792)]. While each family has the core sequences that define the HSA domain, they each also have additional sequences that distinguish these families from one another. For example, the sequence HWDY(L/C)EEEM(Q/V) is found in the SRCAP/p400/DOM family, whereas the sequence HQE(Y/F)LNSILQ is found in the SNF2 /brahma family [(PUBMED:16024792)]. 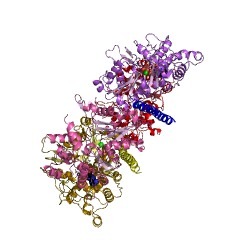 In addition to the SANT and helicase domains, the HSA domain is also found in association with the bromo domain [(PUBMED:11779830)]. There are 2158 HSA domains in 2154 proteins in SMART's nrdb database. Taxonomic distribution of proteins containing HSA domain. This tree includes only several representative species. The complete taxonomic breakdown of all proteins with HSA domain is also avaliable. Click on the protein counts, or double click on taxonomic names to display all proteins containing HSA domain in the selected taxonomic class. This information is based on mapping of SMART genomic protein database to KEGG orthologous groups. Percentage points are related to the number of proteins with HSA domain which could be assigned to a KEGG orthologous group, and not all proteins containing HSA domain. Please note that proteins can be included in multiple pathways, ie. the numbers above will not always add up to 100%.